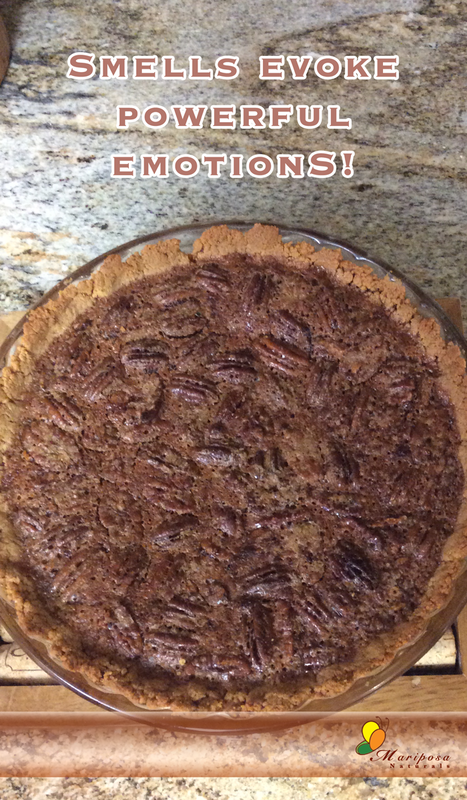 The smell of pecan pie is a feel-good smell for me! It’s no secret that certain smells evoke memories and emotions. Bringing back both the good and the bad. The smell of walnuts reminds me of my grandmother’s farm. She had a walnut tree and a shed that reeked of walnuts. Yet I realized a few years ago that I also associate the smell of walnuts with head pain. It turns out that this was my first migraine trigger! The smell of homemade biscuits also remind me of my grandmother because she made them every morning whenever we visited her. 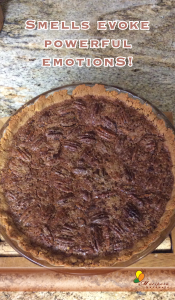 While I can’t really say that the smell of pecan pie evokes a certain memory, it definitely evokes some serious feel-good emotions for me! How far would you take it though? Even though I love the smell of baking biscuits and the memories it evokes, I would not want to smell it all the time. If for no other reason than it would eventually lose the power to evoke the memory. Is the shortcut to a man’s heart through his nostrils? Apparently, though, I could be in the minority. Recently, according to my Google Analytics, my blog showed up in the list returned when someone searched for “KFC Perfume!” Now that’s just crazy! Crazy that my blog showed up. Even crazier when you learn there actually is a KFC Perfume! OR, at least there was a KFC scented candle for a while. Not to be out done, Pizza Hut has created a pizza-scented perfume! Sadly, though, in case you wanted some, it was a limited-edition item from 2012. Sorry! It’s been said that the way to a man’s heart is through his stomach. Could you also take a shortcut by tempting his nose? Seriously, though, since scents evoke strong emotions, they are a large industry because companies know that the way to our pocket books is through our noses! P.S. There must be something to it and to the power of suggestion. As a child I ate enough fried chicken to last a lifetime. And I rarely eat it anymore. Very rarely. But right now? I can almost taste it after just thinking about it while writing this post! What smells evoke specific memories or emotions for you? What are your thoughts on pizza or fried chicken perfumes? Previous PostTrade Secret: Code for “You Don’t Want To Know”Next PostEssential Oils – Friend or Foe? Thanks for reading, Sammie. And it’s true that our intuition sometimes knows best!